Near Lion’s Gate is a large wooden door that gives access to the White Fathers’ compound and one of my favorite sites in Jerusalem’s Old City – Bethesda pools and the Church of Santa Anna. Mary (mother of Jesus) was born to Anna and Joachim who lived near the Bethesda pools. Because Jerusalem is on the edge of the Judean desert water has always been crucial for the residents of the city and the first pool was built in the 8th century BCE, when a dam was built across the valley, collecting rain runoff in a reservoir (40×50 meters), known as the Upper Pool. A sluice-gate in the dam allowed the water height to be controlled, and a rock-cut channel brought the water into the city. Around 200 BCE, the channel was enclosed, and a second pool (50×60 meters) was added on the south side of the dam. In the 1st century BC, natural caves to the east of the two pools were turned into small baths, as part of an asclepieion, a healing temple. As it was outside the city walls, scholars think it likely that the Roman garrison of the nearby Antonia Fortress built the site as they would have been able to protect it. According to Christian tradition the site is one of two places in Jerusalem where Jesus performed a miracle, healing a paralytic of 38 years (John 5:1-15). In the mid 1st century CE, Herod Agrippa built the third wall enclosing the northern area of the city and bringing the asclepieion within the walled city. When Hadrian rebuilt Jerusalem as Aelia Capitolina, he placed a roadway along the dam, and expanded the asclepieion into a large temple to Asclepius and Serapis. In the Byzantine period, 5th century, a large church was built on the dike, requiring support of two rows of arches. After the Crusader conquest of Jerusalem in 1099, the Byzantine church, destroyed by the Persians in 614 CE, rebuilt by patriarch Modestus and destroyed in 1009 by the Fatimid Caliph Al-Hakim, was rebuilt on a smaller scale. 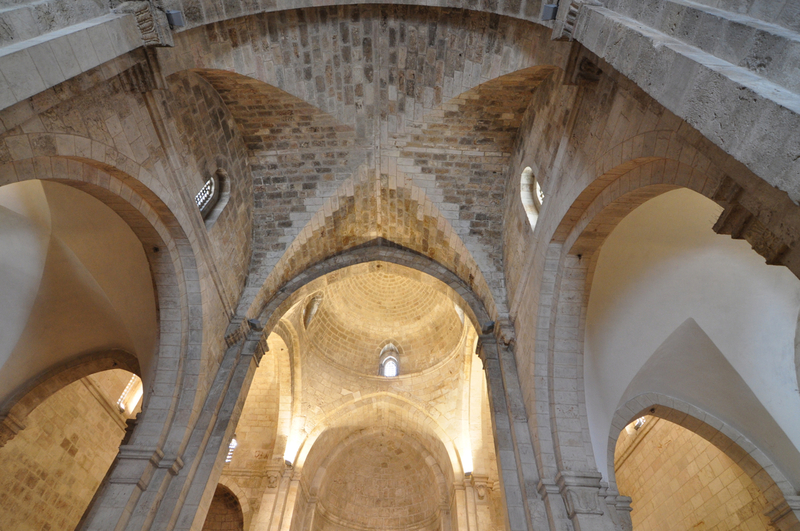 A new Romanesque church, named for Saint Anne was completed in 1138 CE by Arda, widow of Baldwin I, the first Crusader King of Jerusalem, built over the site of a grotto believed by the Crusaders to be the birthplace of Mary. After the conquest of Jerusalem by Saladin it was transformed into a school for Islamic jurisprudence. Over time, the buildings fell into ruin. In 1856, the Ottomans, in gratitude for French support during the Crimean War gave the site to France. It was subsequently restored, but the majority of what we see today is original. The three-aisled basilica incorporates cross-vaulted ceilings and columns, clean lines and an unadorned interior. Because of the fine stonework and large volume of the church the acoustics are amazing. The altar is by the French sculptor Philippe Kaeppelin – on the front of the altar are depicted the Nativity, the Descent from the Cross and the Annunciation; on the ends the teaching of Mary by her mother and her presentation in the Temple. 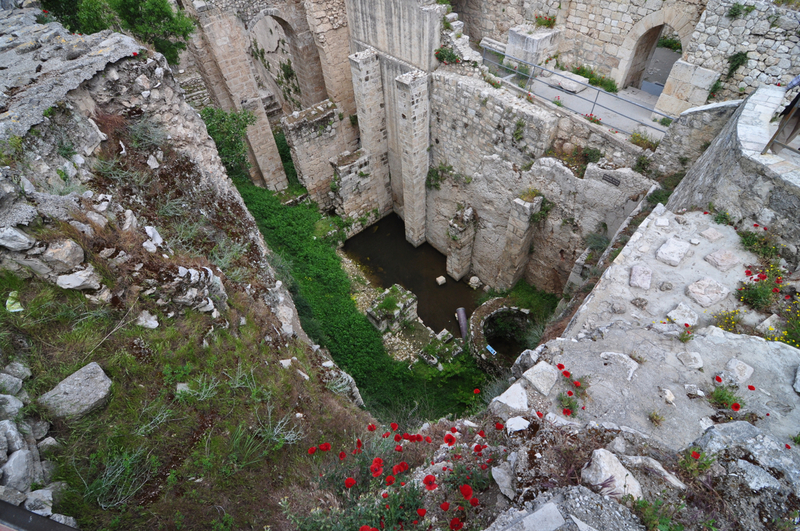 This entry was posted in Archaeology, Architecture, Art, Church and tagged Aelia Capitolina, Antonia Fortress, Crusader, Mary, Saint Anne, water reservoir on May 8, 2013 by Shmuel Browns.